Today is the start of the 2012 school year for my boys. As they enter fourth grade and kindergarten, we are smiling and positive about everything. Of course, challenges along the way may happen and sometimes it is hard to help children to overcome these obstacles to keep going toward positive thinking. Thanks to Wiley Publishing, I heard about an inspirational new book to read in the classroom, at home, or any other time you need a reminder about being positive. Being a child in school is a lot different these days than it was when we would little. 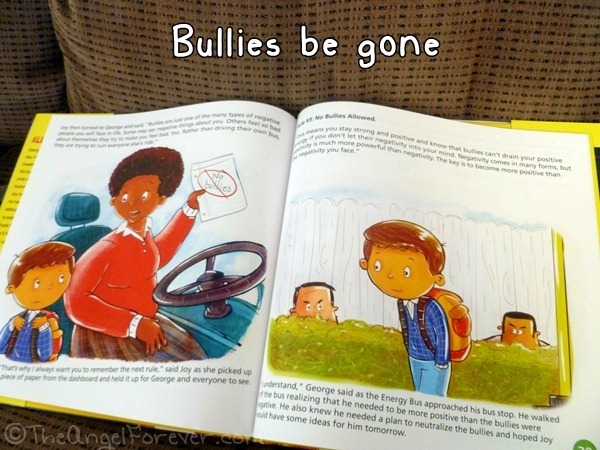 Now, we not only have peer pressure, we have multiple types of bullying situations, social media presence, and beyond. Parents, educators, and other influential adults need to help children to step off on the right foot thinking about things in a positive manner. 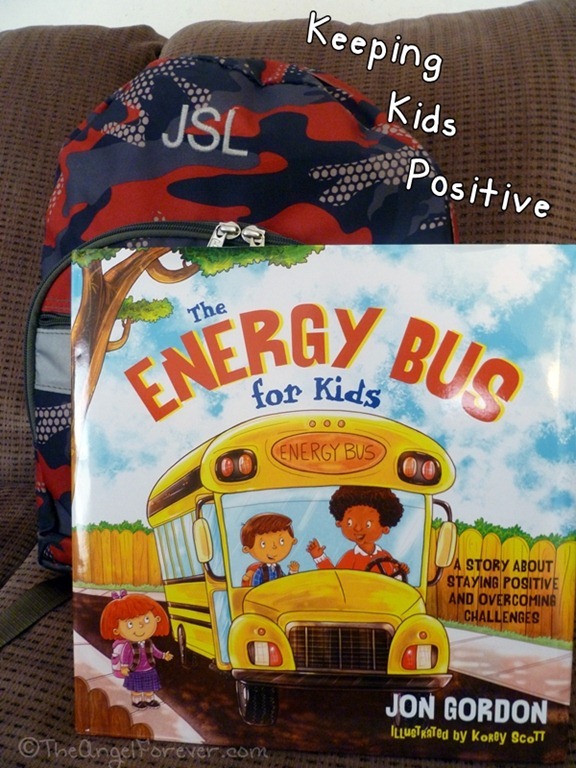 I have to admit, as someone who often things of things as the glass is “half empty” attitude – The Energy Bus for Kids: A Story about Staying Positive and Overcoming Challenges got me thinking as well. 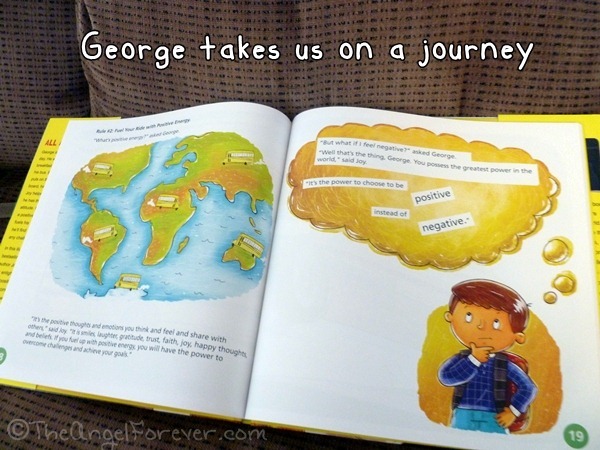 When JSL, entering kindergarten today, and I read the book together we immediately felt like we had entered the world that George lives in thanks to the beautiful illustrations from Korey Scott. 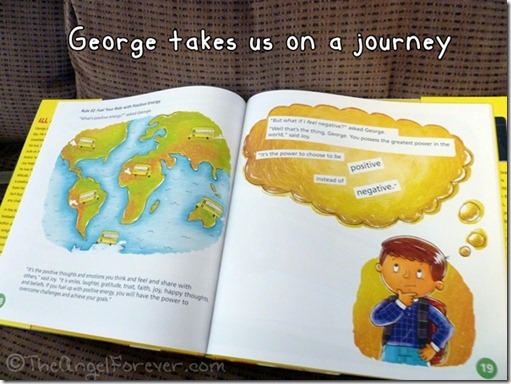 We watched George worry, wonder, and learn in front of our eyes. We saw how he learned to focus on the positive, see the best in others, and not dwell on what could have been. His new bus driver Joy opens his eyes to new valuable lessons that he is able to apply each day at school and at home. My kindergarten kid has years of academics and other adventures in front of him. Reading this book before he starts his academic career was interesting. He truly had a positive view of everything. 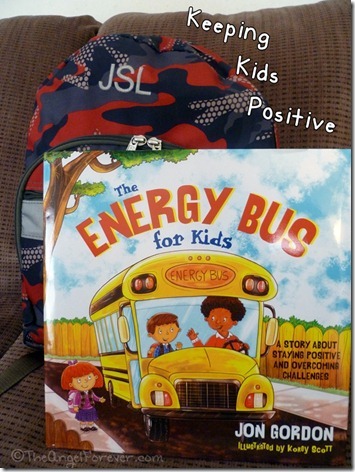 I do believe The Energy Bus for Kids will be great to keep around in case we have a rough day and need a gentle reminder of positive goals and outlook. My plan is to read this on the eve of fourth grade with my nine year old son. As a child who has had ups and downs and been removed from a school because he was being bullied, this will be a nice conversation starter about letting go of the past and keeping a positive approach to this brand new school year. Jon Gordon reminds us that we have the ability to fuel our lives with positive energy to overcome challenges by using your attitude as your guide. I would highly recommend this book inside and out of the classroom to use with children. It would make a great beginning of the year character building mini-lesson and can easily be built on for more getting to know you activities and beyond. There is even a free teachers guide (with lesson plans) and activity journal to download on EnergyBusKids.com, along with other resources. There are bus tickets, kindness cards, ticket of appreciation, rules card, license plate, and items for parents/teachers. I may even print out the journal to use with my own boys at over the next week for enrichment. Disclosure: I received this book complimentary of Wiley in order to facilitate this review. No other compensation was given. The opinions expressed in the review are my own. An Amazon Affiliate link is included in this post for the book mentioned. I will receive a percentage of money for the sale should you opt to buy the book through that link. Thanks Beth for sharing…I most definitely will be grabbing a copy! Hope your first day was a good one…we still have 2 more days off! Fourth grade and kindergarten! I hope it goes great for them! I hope your little one comes home with good tales of his first day. Do you think this book is good even if kids don’t ride a bus to school? Just before school started, I picked up the book Have You Filled a Bucket Today? by Carol McCloud. It’s a good reminder to do nice things for others and in the process, fill up your own “bucket” of good feelings about yourself. @Holly – Neither of my boys ride the bus and I think it works well for them. The new school we are in has program centered abound the Have you Filled a Bucket Today book. When NHL went there at the end of second grade, he had to read it and do the project. Personally, I think The Energy Bus for Kids may be a bit better for older kids. Not sure if younger kids have really experienced enough negativity to fully grasp all that the book has to offer. Of course, it’s a sweet book with a powerful message that will work for the age group you mold it to. The website has some nice sheets to do with kids as well. I hope kindergarten and preschool are going well for your boys.